Frustration and/or stress is one of the most common problems right at the beginning of training with positive reinforcement. And frequently, unfulfilled basic needs play a major role here. In my experience, hunger is the most common reason for horses to become overexcited around food. A horse that is hungry quickly becomes frustrated. Especially at the beginning, if the criteria are not yet clear and the horse still has to understand the basic rules of the game, the training can be extremely challenging for the horse. And even if the criteria for the reward are clear, it might be very challenging to develop relaxation and calmness in training. Often we can observe displacement behaviors, like “snatching” or even biting. Very often, you will be able to tell that a horse is frustrated by the way the horse takes the food or crowds the trainer and wants to be very close. If the handler is still a beginner, to him/her it can look like “positive reinforcement is not suitable for my horse” or the person is simply unable to cope and gives up training with food altogether. Also, problems with stimulus control, such as throwing behaviors at the trainer, are strongly influenced by hunger. This is often misinterpreted as the horse being overly motivated and so the horse’s “hardship” isn’t recognized. For the horse, however, it simply makes no sense to display a behavior permanently if it doesn’t lead to a reinforcer. Every organism behaves for outcome. If there is no outcome, behavior would normally decrease or disappear. So the permanent offering of different behaviors is kind of unnatural. It is important to take a close look at the basic needs of the horse in case of training problems, even if you think there is no deficit here. Often we do our best to optimize our horses’ living conditions and do not even consider this. However, the feeding of horses with different needs within a group is problematic because individual solutions are often difficult. Or the keeping basically doesn’t match the needs of the horse and the feeding must be regulated. Then often “Slow Feeders”, such as hay nets or “Grazing Muzzles” are used as exclusive food source, which can entail an often underestimated stress potential. Due to tight meshes or small inlets, the horse might chews less than would be needed to create a feeling of satiation. Or the horse might actually get too little amounts of certain nutrients, so it continues to feel hungry. An increased release of stress hormones, due to frustration during eating also affects training because stress hormones remain in the organism for a relatively long time until they degrade and quickly become a fundamental problem. Sometimes there is no other option but to limit the food source or to just feed less than the horse would normally need. In this case, a compromise should be found. This also means that you need to muster much more time,patience and of course, a lot of understanding for your horse’s behavior. But be aware that if this kind of problems affects your training, it clearly indicates a major impairment in the horse’s life and thus a major health risk. Chronic stress affects the whole organism both physically, and mentally and can have serious short- and longterm consequences . Sometimes there is no optimal solution and you have to decide what to settle for(e.g. if a slightly overweight horse is less of a problem than a permanently stressed, frustrated horse). In fact, sometimes the only feasible solution is changing the environment in order to provide suitable living conditions, even if this means to move the horse to another stable, in case the problems can’t be resolved otherwise and no acceptable compromise can be found. Anyone suspecting that the above could apply to their horse, should experimentally feed a large portion of hay, hay cubes or other forage (taking into account what the horse is allowed to eat) before training. After a short break (15 to 60 minutes) observe whether the behavior of the horse changes during training. A food deficit (= hunger) is very likely, if the horse now is more concentrated or calmer, if it takes the food more carefully after a short while and if training mistakes can be ruled out, . In this case, it makes sense to feed at least a small portion before training, until a long-term solution has been found, in order to set especially horses new to +R training up for success . In addition, frustration can lead to aggression, which causes a potential risk of getting hurt. During the first sessions of positive training, especially if there is a corresponding history with problematic behaviour , I highly recommend training behind a barrier (i.e. in protected contact), and to initially train simple behaviors such as touching a target or just standing still, facing forward. This is also a good choice for unexperienced horses and trainers, as not only does the human feel safer, but it also prevents people from getting into situations in which they are tempted to defend themselves with punishment, causing further stress. Also, the change between training and pausing should be introduced right from the start, since the training with positive reinforcement for the horse – and also for the human – is exhausting and the ability to focus usually decreases after a few minutes. At the start, the sessions should last only a few minutes and the pause should at least be as long as the training sessions. To further reduce stress, the horse should also have access to hay / roughage and water during the sessions and the value of the reinforcers should be comparable to that of the freely accessible food. In case of increasing stress, the horse is likely to use the opportunity to eat the offered food, rather than crowding the human and/or becoming more frustrated because of the food reward. 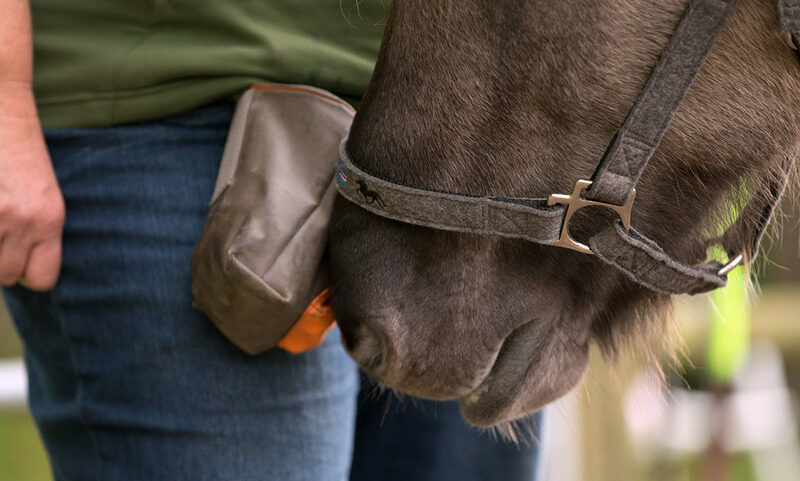 This provides choice and control for the horse and prevents emotional pressure, which is important for a relaxed training setting. Of course, not only deficits in feeding can cause stress. Unfulfilled basic needs such insufficient movement opportunities or an unsatisfied wish to play caused by an unfavorable herd constellation also influence the stress factor. Just like in us humans, the foundation for a pleasant learning experience lies in the fulfillment of basic needs. Special thanks to Iris Stamberger for her help with the translation! If you want to stay in contact and don't want to miss new stuff, subscribe on the right side of this box! I use positive reinforcement in the form of food treats with my horses except one who becomes aggressive if he knows you have treats. The others are fine and I do feel the positive reinforcement treats improve their desire and enjoyment of training sessions and our relationship. So in general I don’t have problems with using treats with most horses. We have one horse though that if you have treats can only focus on getting it off you. He will try to barge into you, biting at where treat is, trying to bite you when you try to restablish distance or block him, striking out with hooves in frustration, randomly offering different behaviors unasked for, and utterly unable to focus on anything else. He has constant access to hay in a slow feeder, he goes out on pasture daily in summer, he gets turnout in a dry lot with a slow feeder in winter, has an always filled hay slow feeder in his box, and we train sometimes directly after he has eaten a bowl of mash or grain ration. I tried training on an enclosed grass lot and the same behaviors ocurred although at times he would go to eat grass after being redirected from mobbing me for treats. Then he would return to harassing me for the treat. Of course in between he will also sometimes get what I am asking for and then gets rewarded but then still tries to get at the treats and is sometimes striking at me and biting when I am not just giving them. Not a very productive, positive way to train. I can say definitively he is not hungry or maybe it is a case of he will never not be hungry. I think the desireability of the treat vs. normal foodstuff may be too much for him. I have tried various treats and they all seem more desireable over the normal grass or hay probably as they are something different. We did do the basic training with target and behind a divider. That worked so long as we just do that. Without barrier he is just obsessed with the food to the point its a distraction from learning and a bit dangerous. I had some luck with teaching him to touch a cone and having that in the training area. He will try obsessively touching the cone for the reward rather than mobbing me. I don’t reward the cone touching unasked for but as he looks for reward after touching it and not mobbing me for the treat I use that opportunity to ask for other behaviors. Sometimes that focuses him more positively and we can progress to other things. Then reurn to cone if he starts to get aggressive again. We use back up cue in a similar way with some success but he sometimes gets aggressive if he backs up and doesnt get rewarded but knows you have a treat and it can lead to him repeatedly backing up to get a treat and then crowding and getting frustrated perceiving when it is being used a discipline measure and is not rewarded. Touching the cone and manipulating it can slow his mind set on the treat enough to make some opportunity for more productive conversation with him. Also he bites the cone and can release some emotion on it instead. He learns much better though and its less stressful for us both without the treats. I use positive reinforcement in form of release, breaks, giving him space without any requests or pressure, and scratches or rubs. He does much better with this approach. But I wouldn’t want to not use food treats as a positive reinforcer with my mare. She clearly enjoys this and I can see a clear positive change in two way engagement with her. She is very respectful and well mannered about food rewards. I do think based on my experience that some horse personalities are just problematic with the use of food in training. It is not so easy to attribute it necessarily to a food management or turnout issue. This horse gets constant hay access and is turned out daily. Nor is it necessarily poor handling. I use food as a positive reinforcer with other horses successfully. Although I am sure a more skilled positive reinforcement trainer might be able to school him more successfully he clearly as an individual finds the food more too over stimulating than other horses despite all other factors being identical.